Which Of These Indigo Adult Characteristics Do You Have? Many of us can be indigo adult, you can be young and still be one. Those who are indigo’s are not simply born in 1975 to 1995, however that seems to be where the biggest group of indigos come from. If many of these characteristics speak out to you. You may be an Indigo adult. ◆ You don’t have any top grades, but you are very intelligent. ◆You love making things and seem very creative. ◆ Constantly need to find out why. Specially when you are inquired to do things. ◆ You don’t like repetitive tasks, so school work seems tedious. ◆ You were very rebellious in college/school, declined to do any home work, refused authority or you wanted rebel, but couldn’t because of pressure from your parents. ◆ You might have experienced depression, you felt helplessness. These ranged from suicidal tendencies to sadness and despair. ◆ Have difficulty fitting into service oriented occupations. Most Indigos reject power and class related jobs. ◆ Favor leadership roles or prefer working alone than to working in a team. ◆ Seem intolerance of ignorance but have deep connection and empathy for people. ◆ Can be emotional, like crying for no reason or be the complete opposite and showcase no emotion. ◆ May have problem with anger. ◆ Have problem with systems they consider failed or broken, ie. educational, medical, legal, and political. ◆ Feel alienated and angry with politics, you feel your voice will not matter or the outcome doesn’t matter to you. ◆ You are frustrated with the 9 to 5 occupations, marriage, kids etc. ◆ You are angry at your rights being taken away or angry at big brother watching you. ◆ You have an inner desire to change things and make this world a better place. ◆ Have many spiritual or psychic interest and seem to appear when you were young. ◆ You don’t seem to have any role models. ◆ You seem to jump around a lot in your conversations, random behaviors patterns linked to your strong intuition. ◆ You have had many psychic encounters, seeing spirits, OBE, hearing voices, premonitions and such. ◆ You are electrically sensitive to items like watches which seem to malfunction or street lights seems to go out as you go under them. ◆ You have knowledge of other dimensions. ◆ You are sexually very expressive or you may disapprove sexuality with the purpose of a higher intimate spiritual connection. ◆ You seek meaning to your life through spirituality. ◆ You are determined to find balance to become stronger, happy and healthy. 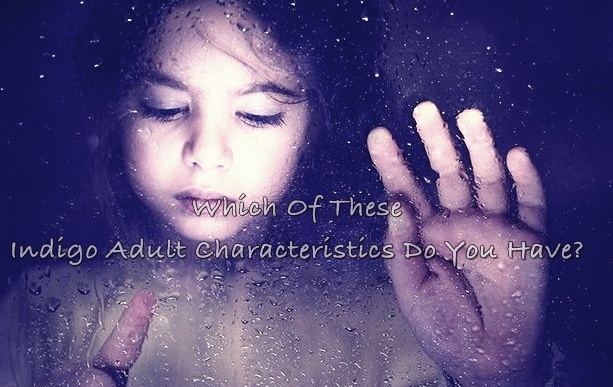 Which of these indigo adult characteristics do you have? Some may have few of these but those who are indigo adults have more of these.